It’s an Easter tradition I love. Hot Cross Buns. I have no trouble getting up at the crack of dawn to make these on Good Friday morning. The reward is not only the sticky, spicy deliciousness at the end, but the smell of Easter through the house which beckons the other hot cross bun lovers in our family down to the kitchen. I have to say that because there are two children who do not like them at all – I think it’s the presence of dried fruit in them that offends. For me though, it’s the perfect way to kick off the Easter weekend. Hot Cross Buns and a lovely cup of tea. The recipe I’ve used year in and year out is adapted from my tried and trusted Good Housekeeping cookbook. The recipe below makes twelve, but I double it so I have enough to surprise our neighbours with a late breakfast treat. A few tips before you start to help you make the perfect bun. First, to give yourself a few extra minutes in bed, measure and sift the flour and spices into your bowl the night before. Don’t forget to stir in the sugar. More than once I’ve forgotten to put it in. Making any sort of bread takes some time so checking the ingredients saves frustration and disappointment. On the morning, melt the butter first so it has a chance to cool off a bit. Make yourself a cup of tea or coffee and then start. Melt and cool the butter. Sift the flour, salt and spices into a bowl and stir in the sugar. Make a well in the centre and add the butter, yeast, egg, milk and water. Add the currant and mix to a soft dough. Rub your surface with a bit of melted butter, turn your dough out onto the surface and knead for about 10 minutes, until the dough is smooth, elastic and no longer sticky to touch. Put in a bowl, cover with a clean tea towel and leave to rise in a warm (not hot) place until doubled in size. Turn the dough out onto a lightly floured surface and knead for 2-3 minutes. Divide into 12 and shape into buns. Roll out the pastry on a floured surface and cut into thin strips. 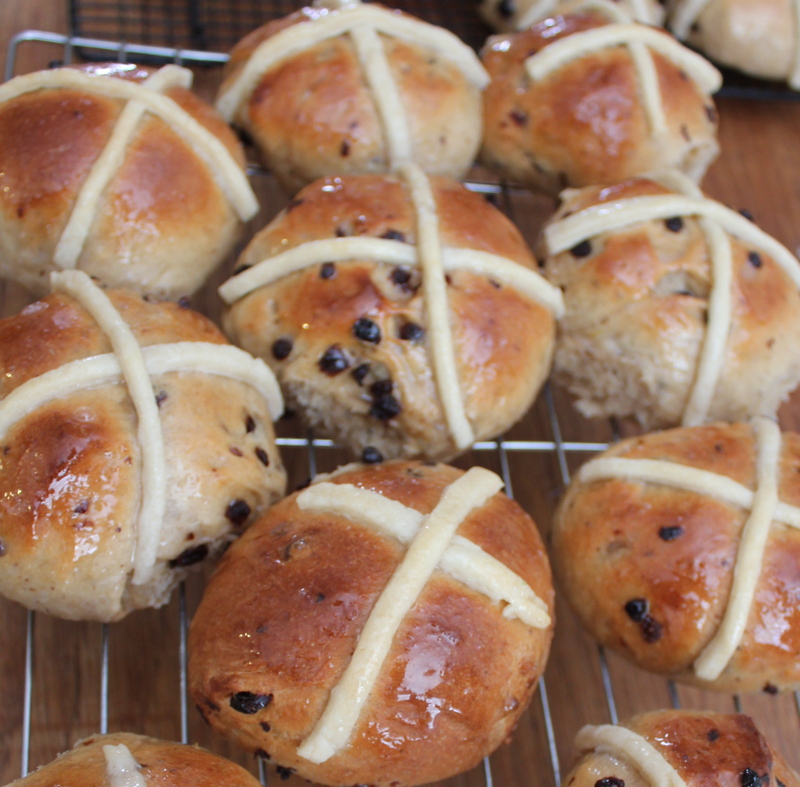 Dampen them and lay them on the buns to make a cross. Bake in the oven at 190°C/375°F for 15-20 minutes until golden brown. Heat the milk, water and sugar together in a small saucepan. Brush the hot buns twice with glaze, then cool. Alternatively tuck in straight away. If you have any left over, they’ll keep for a couple of days, but are best eaten fresh. Having given you this recipe, tomorrow I am trying a different one. Being a big fan of ‘The Great British Bake Off’, I bought Paul Hollywood’s book, ‘How to Bake’ when we were in the UK last summer and have not regretted it. I use it all the time. His methods are different to the way I learned to make bread, but they all work. I am now pretty proficient at making his eight plait loaf which has become a family favourite. Anyway, I’m trying his recipe for Hot Cross Buns tomorrow morning. It’s risky. I’ll let you know if the household approves. What do you use for the shortcrust pastry? do you buy it? make it? I’m not really a pastry person so I don’t really know these things. Bread I can do! I think I will try this tomorrow (though not before brekky as that’s normally at 6:30…. I make it – 50g flour, 25g of fat (Half butter, half shortening), rub in the fat until it resembles breadcrumbs, add a little chilled water until it just comes together. Cover in cling film and chill for at least 15 mins before rolling out and using. Happy baking!